Want to have an experience that reeks of magic? No, not prestidigitation or illusion. Not that Doug Henning or Harry Potter mumbo jumbo. Not carney tricks or flights of fancy. I’m talking real magic. Old world magick. The stuff that infuses the act of living with wonder. And what about the psychological aspect? Is that where your intrigue lies? Who hasn’t given thought to the idea that the person “inside” is vastly different from the one that is presented on a daily basis? The real us. The one we like to say nobody really knows. Good art has a way of revealing that inner self to us, whether it be through the work of an artist we admire or through our own artistic projects we hope to infuse with the essence that makes us each unique. That’s the magick I’m talking about. It’s all around us, you know. And sometimes it reveals itself in the most unexpected of ways. I still remember the day my friend Mollie Kellog asked me if I would be interested in modeling for her. (No really, it was July 31, 2014. I looked it up.) She had been working on a series of paintings since 2009 called the Incognito Witch Project, in which the inner self was being explored. The hidden psyche, which is normally suppressed to meet society’s expectations. The inner witch, if you will. Interesting, huh? Hopefully that will give you a little more insight into what I’m talking about as we go along. Those of you who skipped will just have to figure it out for yourselves. So, where was I? Oh, right. Mollie asked me to be a model for her Incognito Witch series. I told her that I was flattered. I hadn’t modeled for anybody since college, when I’d been an artist model at New Mexico State University. I had actually enjoyed the experience, but nobody had ever, then or since, asked me to be a model for an art project. Weird, huh? I’ve been surrounded by artists and creative types my entire life, but none have ever asked me to be part of their process. I truly was honored by the request and told her I would love to be part of that legacy. Mollie told me she would “ponder” on it. She said she would be starting a new group of paintings, a new series that would be “a little more stylized.” She was still working out the details, but when she figured it out, she would get back to me to coordinate something. Five months passed. I thought about it occasionally, but once again change had shifted the geography of my world. I’d left my job at the newspaper and hung my own shingle as a freelance writer and marketing specialist. Needless to say, I was a little preoccupied. I didn’t really have time to think about Mollie’s query. I was still flattered to have been asked, but I wasn’t at all expectant. In late December, sometime after Christmas, Mollie messaged me again. She had just put out a call for Incognito Witches in what she was referring to as the Selfie series. In the call, she was asking for interested parties to dress up as their inner witch and take selfies of the finished product, then send those selfies in so she could paint them. I instantly fell in love with this idea and told her I was in. I documented my part in Mollie’s process in my entry Model Behavior. You can read it now, or wait until later. After that, it was more waiting. This time, however, I got occasional status reports from Mollie. She was documenting the process of creating the Incognito Selfie series on her website and, because I had been one of the first to enter photos for consideration, my selfie was the one being documented. For obvious reasons, this rated very high on my personal coolness scale. 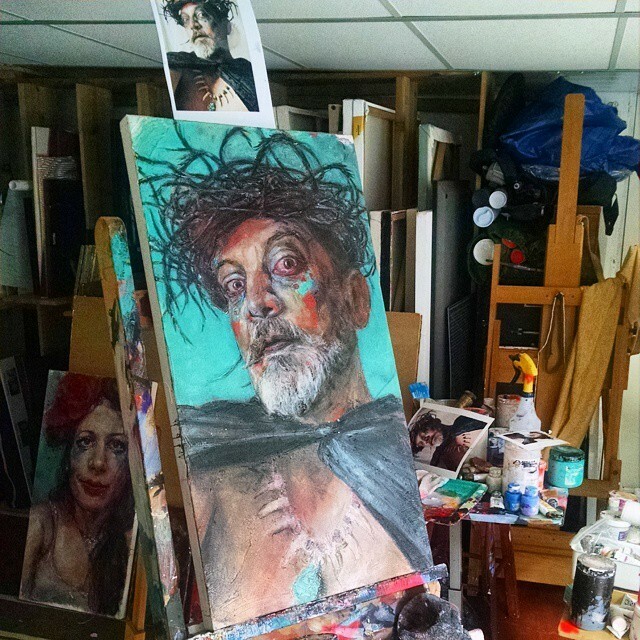 The piece in question, during the creative process. Note the photo clipped to the top of the painting. Now, curiosity has always been one of my driving forces, particularly when it comes to the creative process. I tend to ask a lot of questions. I’ve been told by friends that my questions tend to make them feel like their being interviewed. I usually just smile and remind them that I’ve made my living as a writer for over 30 years. Old habits die hard. And I get great insight that I am more than happy to share. Though the initial contact for this particular project had been about selfies, as my earlier entry attests, we had decided to kill two birds with one stone and do a full shoot first. Once that was completed, I shot the obligatory selfies and sent them to Mollie along with the images she had chosen from the shoot. Having done both in a row, I knew exactly what she was talking about. Three choices taken by me and sent to Mollie for consideration. The third would eventually become the basis for the first painting in the Incognito Selfie series. The “inner portrait” had been about staging and symbolism and capturing that inner fragility that encases the raw soul like the candy coating on one of those pastel Cadbury mini-eggs. 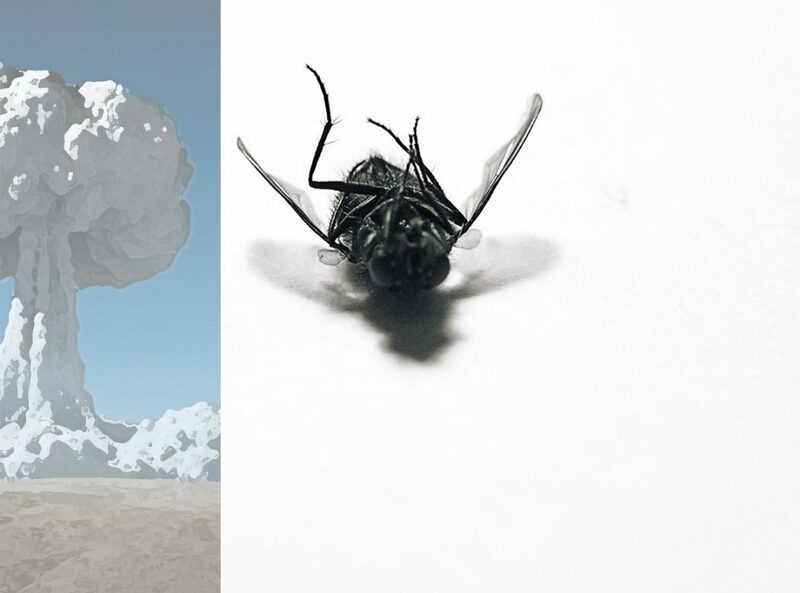 Revealing the inner self against a backdrop of comforting inner mythologies. The selfies, on the other hand, were different. They were more about parting the veil, pushing through the candy coating and drawing out the Id. Making contact with that place deep inside where magick lives. Summing it all up in a close-up portrait of our own devising. 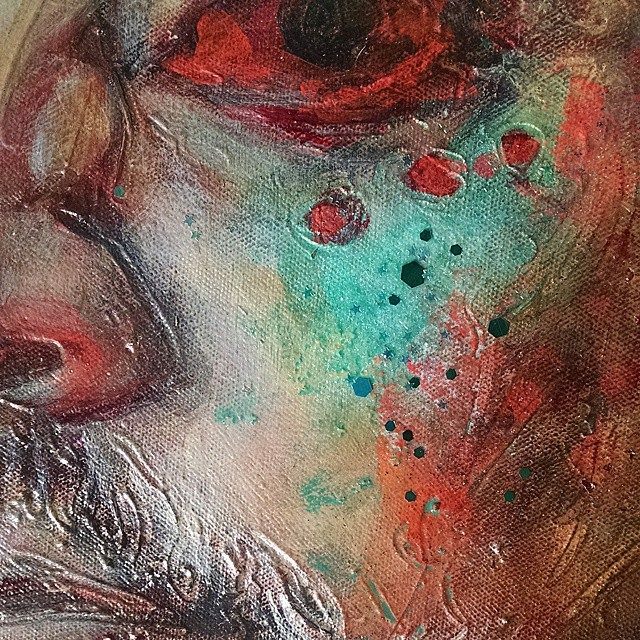 Once captured, Mollie is able to work her own magicks, bringing the photographs to life through a step-by-step process that includes layers of paint, hidden “surprises like dried flowers, shells and glitter, then layers of acrylic varnish to protect the elements “so I don’t scrub them off in a fit,” she says. 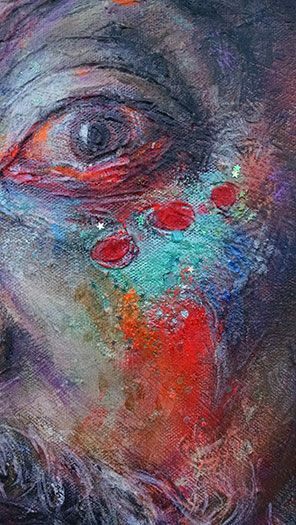 A detail from February 26th in which flecks of glitter can be seen on the surface. The same area on March 6th, showing the different layers that have been added. It’s a fascinating process and I have gotten a lot of great feedback, ever since adding Mollie’s completed Incognito Selfie as my Facebook profile pic. It resonates with people on a very basic level and has received likes and commentary from friends and relatives in all walks of life. Mollie isn’t really surprised, noting that the “hidden inner magick” message has done a whole lot of resonating, not just with individuals, but also with like-minded organizations whose mission is to promote positive change in the world through art. “Since its inception, many models have expressed their bucket-list desire to be a part of the project in order to address self-empowerment, self-love or body issues, and have shared personal stories of healing.” Mollie says. Discover more about Mollie Kellogg and the Incognito Witch Project at her website. 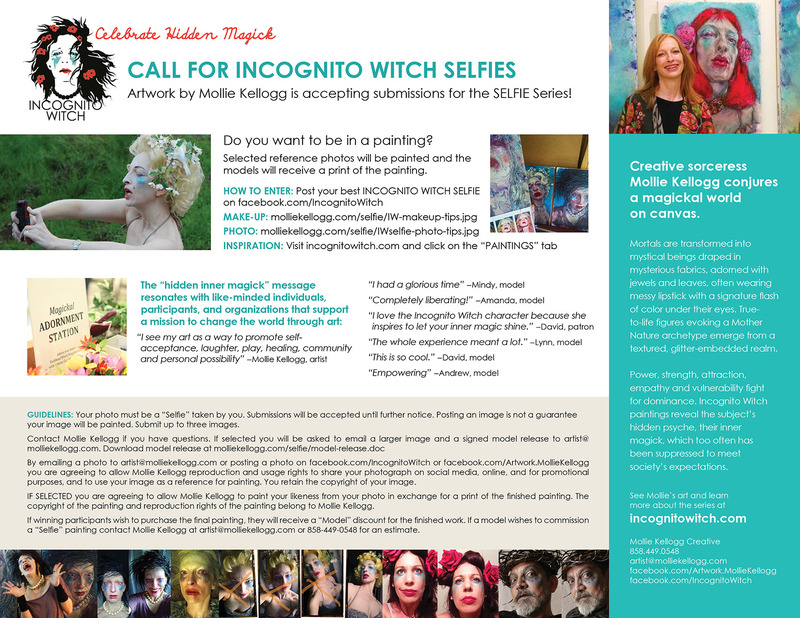 To find out how to take part in the Incognito Witch Selfie series yourself, check this out. Next: Next post: Why Live Theatre? Oh, no, thank you, my dear. It was and still is one of the coolest experiences I have ever had with art.